But along the way, I noticed something funny about my approach to cabbage. 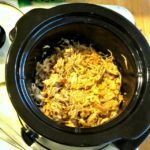 I have recipes for cabbage (both red and green) with several kinds of pork. I have cabbage with potatoes. And of course, I have cabbage with potatoes and pork. (I do even have one recipe for cabbage with noodles and cheese… for variety.) But I didn’t write a single recipe for cabbage alone, as a side dish. Which is odd, as we eat it often. 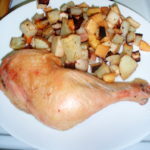 The comparative cost of meat and vegetables in the US is insane – and is the result of massive government financial support of the meat industry, starting with feed crops, and the lack of similar support for the very foods that the nutrition side of the USDA encourages us to eat – but that’s a post for another blog. Here, I just discuss ways to work around the bizarre fact that I can often pay less per pound for chicken than I can for most vegetables. Cabbage is the beautiful exception. It is inexpensive, it is dense, it doesn’t cook down the way many greens do (leaving you with only two servings from an armful of leafy greens!) 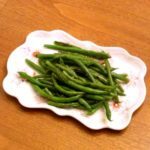 it’s good both raw and cooked, it is incredibly versatile, and because it has always been a good storage vegetable there are vast numbers of recipes for it from around the world. Cabbage also cooks quickly and easily. What’s not to like? 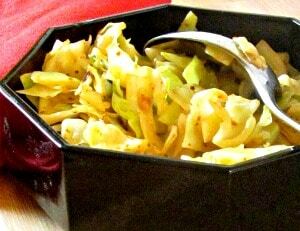 Well – overcooked boiled cabbage – that’s why many people think they don’t like cabbage. 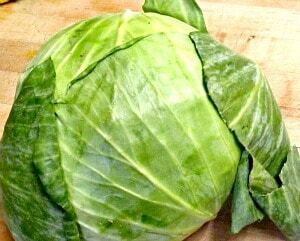 It gets sulfurous, and smelly, and slimy, and unpleasant… I will use cabbage in soup, but I cut it in ribbons and add it near the end, to avoid overcooking. And for most purposes, I saute, rather than boil it. Sauteing cabbage allows you to keep it tender crisp, and either star the flavor of the actual vegetable or add flavors to complement it. You can start with aromatics – onion, garlic – add spices to the oil, use butter instead of oil, and then finish it with broth, other flavored liquid, or other seasoning. So one day you use German style caraway and vinegar, another you use Indian curry spices, and another – harissa. 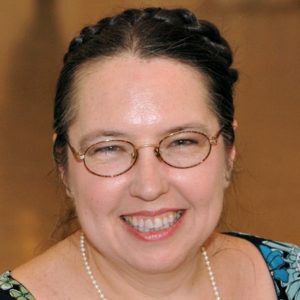 I was reading a piece about Coming Food Trends (hey – we writers have to keep up!) and it predicted Harissa as the Next Sriracha. And I laughed… I don’t use Sriracha, but I’ve used harissa for years. 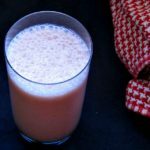 It also adds both heat and flavor – though not the sweetness of sriracha (which I don’t want) and it’s easy for me to keep a tube in the fridge and just squeeze some in when I want a boost of flavor. 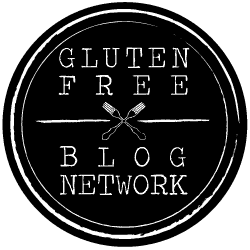 I hadn’t written about it because I wasn’t sure how readily available it was – I couldn’t always get my own hands on it without effort – but it does seem to be turning up around the blogging world, so I guess people can find it. So, back to the cabbage. 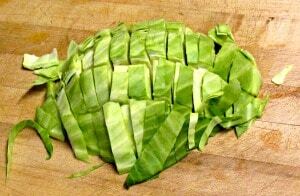 I tend to take a cabbage and a large sharp knife and just cut a chunk off… Then I cut it into shreds or ribbons, as needed for the recipe. (And I measured this at two and a half cups of chopped cabbage.) This time I skipped any onion or other aromatic, and just heated a bit of oil in the pan, tossed the cabbage in it, and stirred it around to distribute the slight amount of oil and start it wilting. After a minute of two, I pushed it to the side, added a splash of water, and some harissa. (I measured out a teaspoon, to give you a frame of reference… I would try that proportion, then vary it after by your own taste.) Taking pictures slowed me a bit, but normally I’d do this very quickly, over high heat – the idea is to dissolve the sauce in the water, distribute it evenly, and finish cooking the cabbage in the steam created by the water. At this point, stir for a few minutes until the cabbage is cooked to your own taste – adding a spoonful or so more water if you need to. 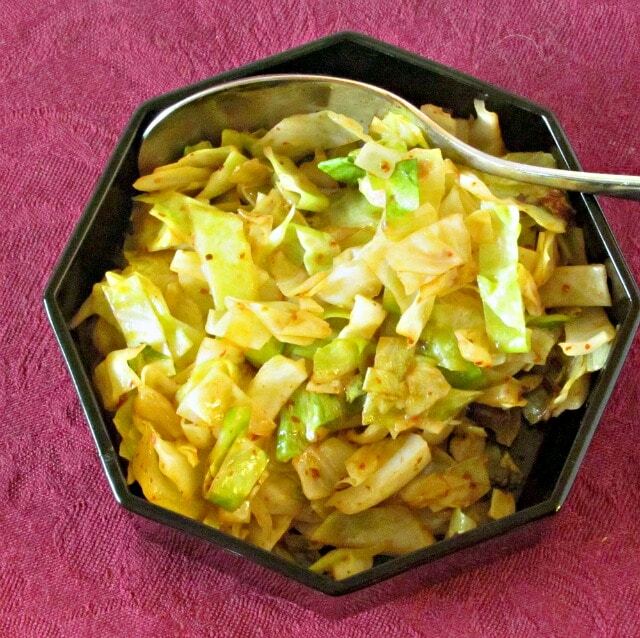 And there you are – sauteed spiced cabbage. You can, of course, just skip the harissa altogether, and serve a plain sauteed cabbage – which might be preferable if another dish is highly spiced. Or you can cook it plain, and pass harissa at the table so those who like it can add it, and those who don’t, won’t. 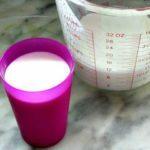 You can also use this as a base for a more complex dish – sauteing meat or tofu with the cabbage, flavoring the combination, and making a whole meal of it. 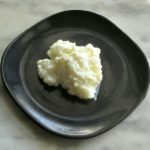 This is really one of the Foundation recipes – here is a basic idea, vary it to work for you, tonight. Chop and wash the cabbage. 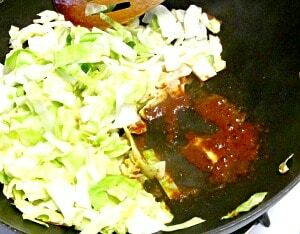 Heat oil in the pan, then add cabbage and stir. Let cook a few minutes, stirring frequently, until it starts to soften. 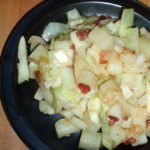 Continue to cook, stirring frequently, until cabbage is cooked to your taste - approximately five minutes. 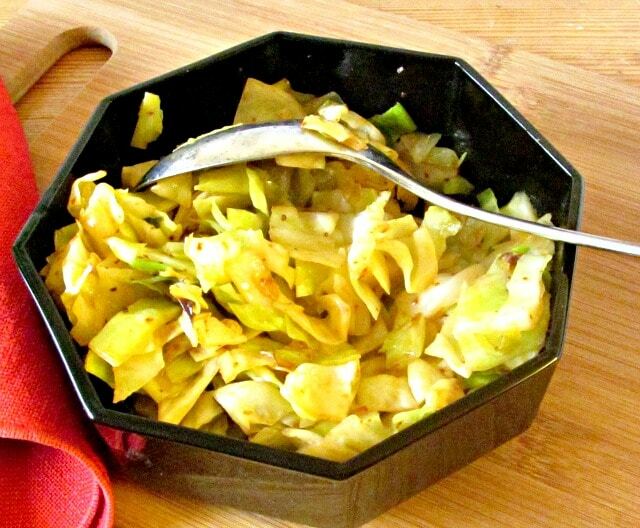 Great post Anne, cabbage does get a bad rap! I do love it though, and will definitely try this recipe. Thanks so much! Well, you're welcome, and I hope you enjoy it! I too have had cabbage just about every way you have had it! But I haven't used Harissa. Thanks for sharing! I have to try it this way as well! I really need more harissa in my life, and this recipe proves it! What a wonderfully simple side dish -- and tasty too boot. Yes I agree that cabbage gets a bad rap. Can't believe how easy it is -- looking forward to making it. Thank you! It's January. We all need something with a little... brightness... And honestly, the cabbage in my supermarket looks better than the "fresh" vegetables they've hauled here from South America, many of which are getting a bit sad... cabbage keeps better! Enjoy it! Sauteed cabbage brings up good memories for me. My grandma would make this at Christmas time with caraway seeds and tomatoes. i can smell it from here! I'm delighted! You know - I've cooked it with caraway, and with tomatoes, but I don't think I've combined them. I'll have to try that! This sounds great! I used to eat a lot of cabbage as a child, but I never think to make it (unless as part of a stir fry) these days, I may have to revisit this delicious veg! I know - I didn't eat it for years! But when I started to get interested in seasonal food, cabbage (which stores easily) kept popping up. And I noted that it was easier to cook than many other greens. (And inexpensive always helps - though I suspect that's one reason we ignore it.) So now most of the winter there's a cabbage in my crisper. Harissa is the next Sriracha?! Fine by me! I love both :) I haven't had cooked cabbage in so long! I need to fix that -- thanks for the inspiration! Well - I don't know LOL but that's what this article said... At any rate, I decided it meant that enough people could get it that I could reasonably write about it! And you're welcome - enjoy it! Creative way to add some nice flavor and spice to what would normally be sauteed cabbage! I'm definitely going to try this soon, I love harissa! Thanks! Thanks! I like the way a simple addition really pops the flavor. I mean, I love sauteed cabbage, but this time of year, sometimes you just need variety.